PROPRIO FOOT is an adaptive microprocessor controlled ankle for low to moderately active amputees. Motor-powered ankle motion increases toe clearance in swing phase by raising the forefoot, reducing the risk of trips and falls. It also adjusts the ankle angle to changing terrain, providing stable foot placement on stairs and inclined surfaces. Heel height can be adjusted for various types of shoes to ensure correct alignment. Users can easily change shoes to fit most occasions as the heel height can be adjusted within the given range. 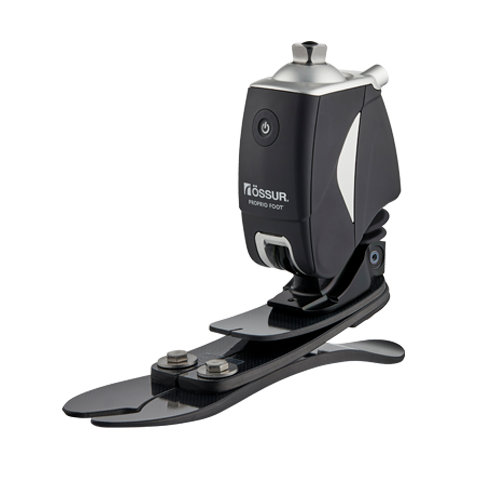 Benefits: Adjustable heel height minimizes misalignment of the prosthesis thus reducing walking fatigue and discomfort experienced with poor alignment. A weatherproof device can be used in a wet and/or humid environment but cannot be submerged. Freshwater splashing against the enclosure from any direction will have no harmful effect. Dry thoroughly after contact with freshwater. Freshwater: includes tap water. Excludes salt and chlorinated water.